I started writing BBC BASIC for the PDP-11 at university on the late 1980s. It got as far as starting up, producing its startup message and prompting for input. A few years ago I wrote a PDP emulator and assembler and resumed work on completing it. BBC BASIC uses standard PDP-11 UNIX TRAPs for I/O (eg TRAP 4 for character output and TRAP 3 for character input), so should run on any compliant PDP-11 UNIX. With a suitable HostIO source BBC BASIC will run on other PDP-11 systems, eg on RSX-11. For example, TubeIO uses PDP-11 Tube EMT calls for I/O. I have been testing PDP BASIC on UNIX Version 6 and Version 7 running on the SIMH PDP-11 and Ersatz-11 as well as my PDPTube emulator. Recently the PDP-11 core has been added to the BBC Matchbox Second Processor and the Tube version has been running on that as well. Download bbcbasic (15K, v0.27, 04-Aug-2018). Copy the file to an appropriate directory or into a Unix disk image with a tool such as putr or UxFiler with 'execute by all' permissions (eg chmod 755). On Unix a suitable location is usually /usr/bin/bbcbasic. Boot into into Unix, log on and type bbcbasic at the user prompt. The source archive includes some demo programs and documentation. 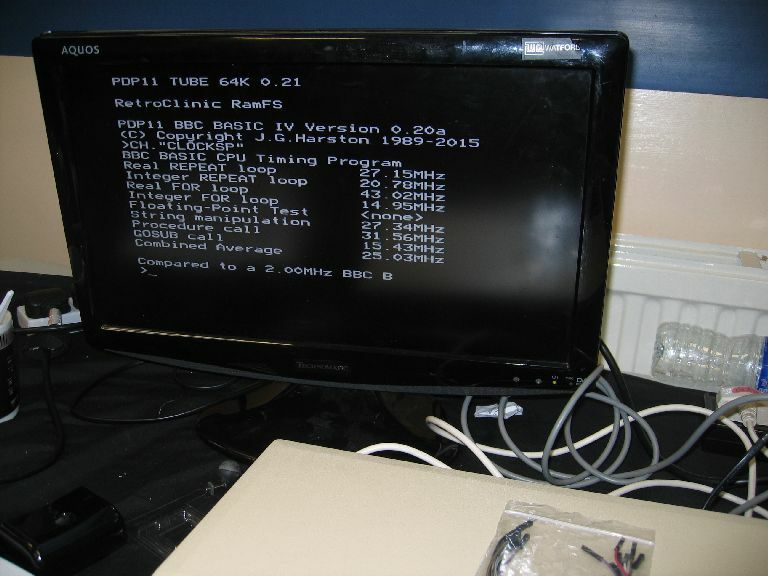 bbcbasic is also directly runnable on PDPTube. Download basic.rom (13K, v0.27, 04-Aug-2017). Load it into a bank of sideways RAM, or program it into an EPROM. With the PDP-11 CoProcessor enabled, PDP-11 BASIC will be the default language and will be entered on Break or with *BASIC. Alternatively, the basic.rom file can be run from the PDP11> prompt. Demos.ssd contains some demo programs, as well as a copy of basic.rom. Install shows more detailed examples on running PDP-11 BBC BASIC. You can also see blog entries following PDP-11 BASIC's development.